Muskmelons originated in the hot valleys of southwest Asia and today there are numerous botanical varieties of muskmelons including: netted melons, cantaloupe melons, winter (casaba) melons, snake or serpent melons, and mango or lemon melons. Technically, cantaloupes are only those muskmelons with a rough, warty surface and a hard rind; however, the name cantaloupe has been applied to the varieties of muskmelons with a netted pattern on the melon surface. Whether you call them muskmelons or cantaloupes, nothing says “summer” like the sweet iconic flavor of a vine-ripened muskmelon. This melon shows the netted pattern on the surface. 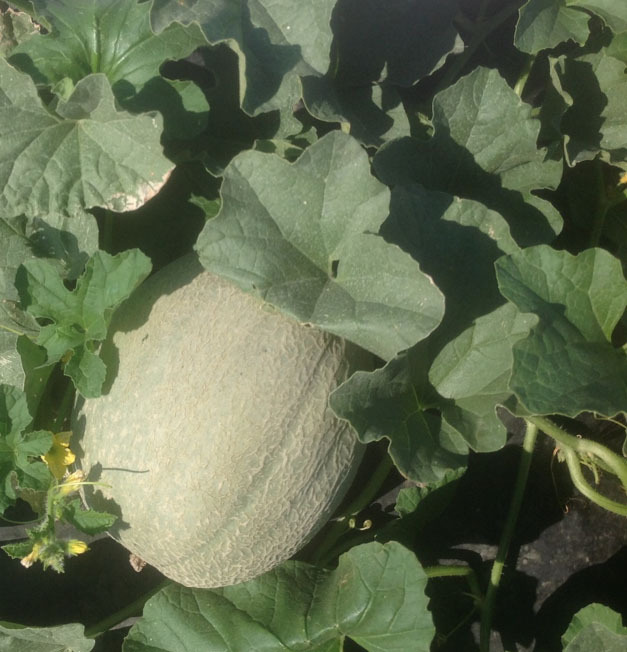 Muskmelons are a warm season crop, adapted to average monthly temperatures of 65 to 75 degrees F, and needing ample soil moisture and nutrients for growth. During the ripening period the best quality melons are produced when hot, dry conditions prevail. Under Ohio’s humid summer conditions, choosing a site with adequate soil drainage as well as good air circulation can help to ensure the desired fruit quality. Keeping plenty of space between plants is important so the leaf surfaces can dry on a daily basis to control foliar diseases. There are many very good cultivars available with more new releases every year. Try several cultivars the first year to find the ideal melon for your microclimate. The table below is a short list of proven cultivars. Discuss selection with seed companies to find melons that fit your area. Remember that newer varieties tend to have more disease resistance in their genetics. This can be a useful tool in controlling diseases like powdery mildew. A knowledgeable seed representative can help in this area. Here are some proven cultivars that are favorites among growers in the melon industry. Most of these hybrids will produce high quality melons with very pleasant flavor. 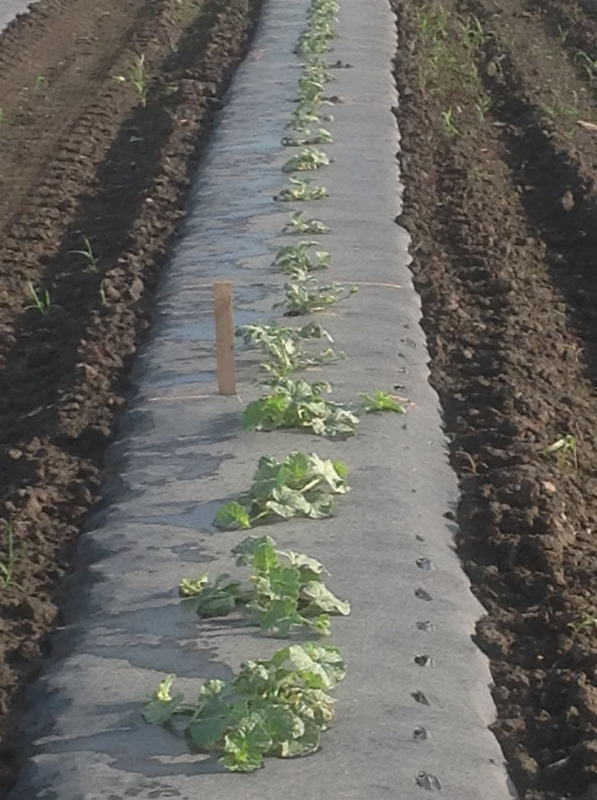 Black plastic mulch is a cultural control for weeds in melons. Using black plastic mulch to grow melons will conserve moisture, control weeds in the row, and provide an earlier harvest. Hills of two plants or seeds should be spaced three feet apart in the center of the strips of plastic. 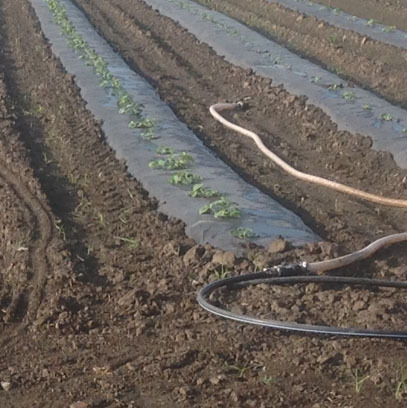 The plastic is placed on five-foot centers, with the center of plants in one row being five feet from the center of the plants in the next row. Melon plants can be purchased for transplanting or started in peat pots or pellets about 25 days before the anticipated planting time. Melon seed will germinate more uniformly and rapidly at warm temperatures, so maintain newly seeded transplants at 85 to 90 degrees F for three days after seeding. Then, reduce the temperature to 70 degrees F until ready to harden-off, which means exposing the transplants to moderate environmental stress prior to transplanting into the field or garden. Since melon plants are very sensitive to freezing temperatures, they should not be set out until all danger of frost has passed. 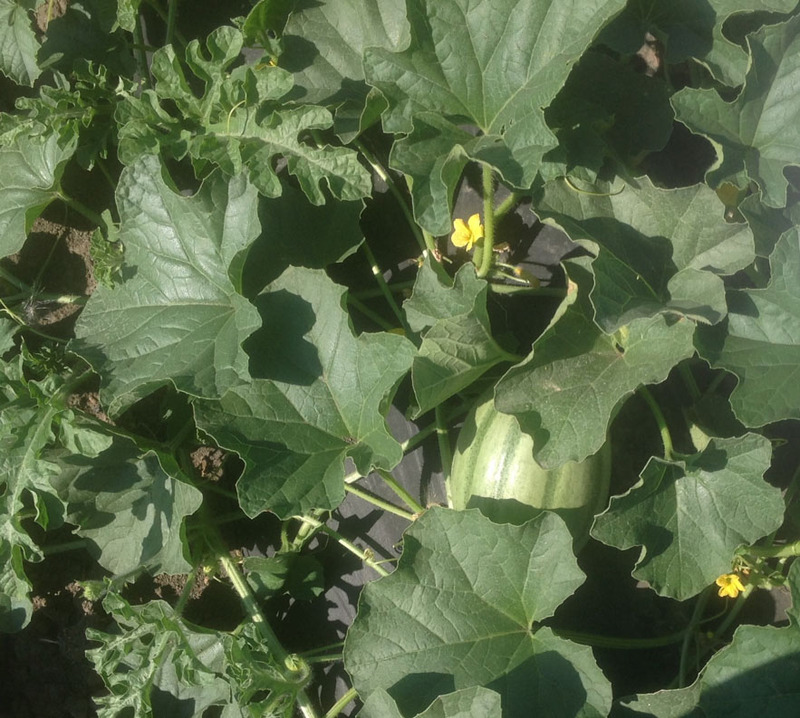 Muskmelons can also be direct-seeded through holes cut in the plastic, but this can delay harvest. Fertilizer and lime applications need to be based on soil test results. Soil sample bags, forms, and instructions are available from your county OSU Extension office. In general, when using black plastic mulch, the following amounts of fertilizer nutrients per 1,000 square feet of plot space would be adequate: 1 pound of actual nitrogen, 2 pounds of phosphorus (P2O5) and 3 pounds of potash (K2O). On bare ground increase the amount of nitrogen by 25 percent as a sidedress application when vines begin to run (or grow) more than a few inches from the main plant. Excessive nitrogen fertilizer can delay maturity and affect fruit quality, especially in seasons with heavy rainfall. Lime should be applied only if indicated by soil test results to raise the soil pH to the range of 6.4 to 6.7. Adequate spacing between plants is one tool to help reduce disease pressure. Cucumber beetles (both spotted and striped) are vectors, or carriers, of a potentially devastating disease known as bacterial wilt. Protecting the plants with insecticides (or row covers until flowering) is necessary, since there are no control measures for bacterial wilt once the plants are infected. Other common insect pests of muskmelons are aphids, flea beetles, and wireworms. Several diseases can be troublesome when raising muskmelons, causing reduced yields or even plant death. These include powdery mildew, downy mildew, alternaria leaf spot, anthracnose, and fusarium wilt. Rotating the place where melons are grown, using resistant cultivars, and fungicides are important control measures. While other control measures can be used to reduce the need for some fungicide applications, the high humidity of Ohio summers makes melon production without fungicides very challenging. In most years, a weekly treatment of a preventive fungicide is a good idea. In a crop year with very dry growing conditions, this may not be necessary. Growers using a weekly regiment to control fungal diseases should select multiple fungicides to rotate rather than use the same product every week. Fungicide rotation will help control and prevent resistance from developing in the disease organism. Melon flowers need to be pollinated to produce fruit. Home gardeners sometimes ask why the earliest flowers on their muskmelon vines do not set fruit. This is because the first flowers developing on the vines are male or pollen-bearing flowers. Only the female, or pistillate, flowers are capable of developing into fruit, making pollination critical. Honey bees are the most effective pollinators of muskmelon flowers. Every effort should be made to protect the bees during the flowering periods to ensure high-quality melons. Melon ripeness can be tested by slipping the stem, which is applying finger pressure to the stem to see how easily the stem slips away from the melon. Many of the newer cultivars do not slip from the vine as easily as older varieities, so look at the description of the cultivar in the seed catalog to clarify this. Fruit that shows a change of color from green or olive-gray to yellowish brown should be considered ready to harvest. For best quality, walk the patch daily. In extremely warm weather the melon patch can be picked twice daily. All photos are by Mike Gastier, Extension Educator, Agriculture and Natural Resources, Huron County. Original author: Ted W. Gastier, Ohio State University Extension, 1993.